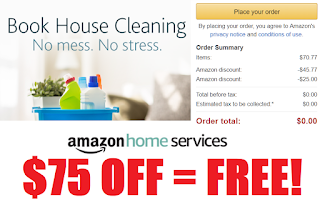 $75 Off Double Stacking Coupons on Amazon Home House Cleaning Services = Free House Cleaning! UPDATE: IT IS NOW $50 OFF, THE EXTRA $25 OFF CODE IS NOW EXPIRED, SORRY! STILL MAKES FOR AN AWESOME DEAL!!! $75 Off Double Stacking Coupons on Amazon Home House Cleaning Services = Free House Cleaning! It is free for small houses/apartments or if you want them only to clean a smaller area of your home. If you have a larger house you may have to pay whatever it is above the $75 if you wish. CLICK HERE and choose. You will get $75 off that price. You can choose the weekly scheduling to see the lowest price. You do NOT have continue after the first visit. This deal is for ONE visit only. If you don't want any other visits then you just let them know after the first visit.